This article continues with one more use case where you can take a look at how to increase the click rates of your onboarding emails with machine learning. In last week’s article, we discussed the benefits and drawbacks of split testing and the advantages of using AI-powered workflow optimization to achieve higher conversion. And to make it relevant I included an example email course, to show you how you can increase the open rate of your emails in drip campaigns. Let’s move along the buyer journey from the consideration to the decision stage. Like in the case of the email course the purpose of an onboarding email sequence is education. But in this example, it’s more of a “software-based” education. So the function of user onboarding is to make it easier for people to get started with your product. By the end of the onboarding, they should be able to achieve their desired outcome. Your onboarding will have a big effect on your customer acquisition. If you screw this up you will lose lots of valuable customers. Although I said it’s more of a “software-based education”, it’s not just a technical onboarding. It’s not just about you showing your prospects the product. It’s more than that! You have to provide value to them as fast as you can! 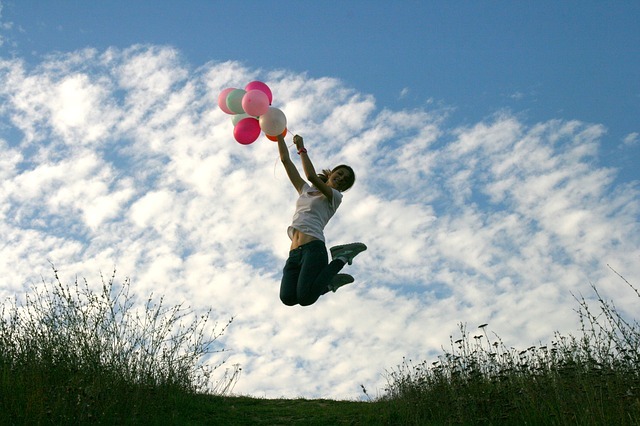 First of all, you should ask yourself: how can I give my leads “initial success”? Not from your point of view, but from the prospects’. So the purpose of onboarding is to make them reach their initial success, which means you won because the next logical step will be paying for your service! Let’s take a look at some tips you should follow to have a successful user onboarding process. You can even look at these tips as a checklist. 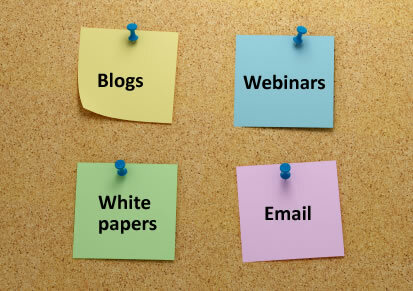 As you build your onboarding you need to take all of these into consideration, so just tick the points you completed. Approximately 75% of users expect a welcome email after signing up? In addition, 90% of users go cold after 1 hour. Help your new trial user to understand the next logical step in order to reach his “success milestone” and see the benefits he or she can gain. This is a great way to help the users who are stuck somewhere in your software. However, you have to use events that will trigger your emails according to your users’ actions. According to newbreedmarketing, the content you provide will have a big effect on user activation. This is a nice gesture that helps you convert the more engaged trial users. But don’t offer too many days! 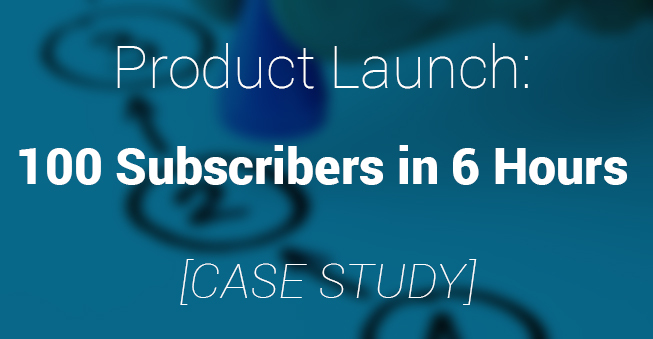 Lead scoring for user actions in your trial will help you identify who should be converted before the trial ends. You can segment your users according to their level of engagement and then send different offers to them. 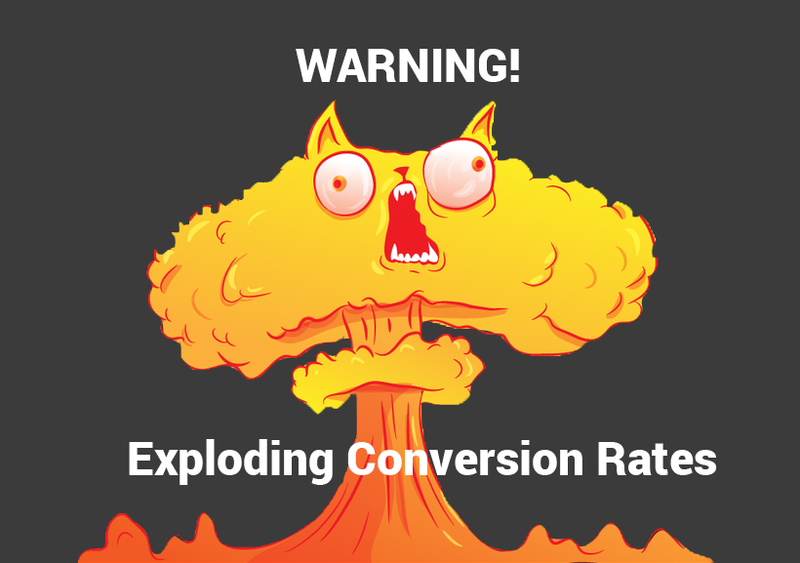 To increase free trial conversion rates you need to understand the reason why users are leaving your product. This is why utilizing exit interviews with users who are not active can be extremely useful. Tutorial: specific educational emails that focus only on your product. Educational: these focus on the benefits of your product and how the users can take advantage of them. Aspirational: case studies, example use cases of your product. Transactional: reports, status updates, invoices. Personal: sent from an employee of your company, usually with a goal of one-to-one, interactive communication. 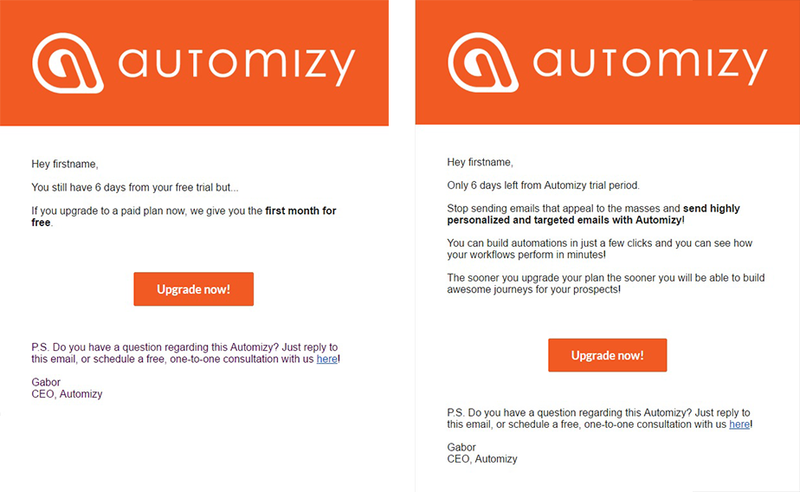 A successful user onboarding email sequence should contain a combination of these types of emails. 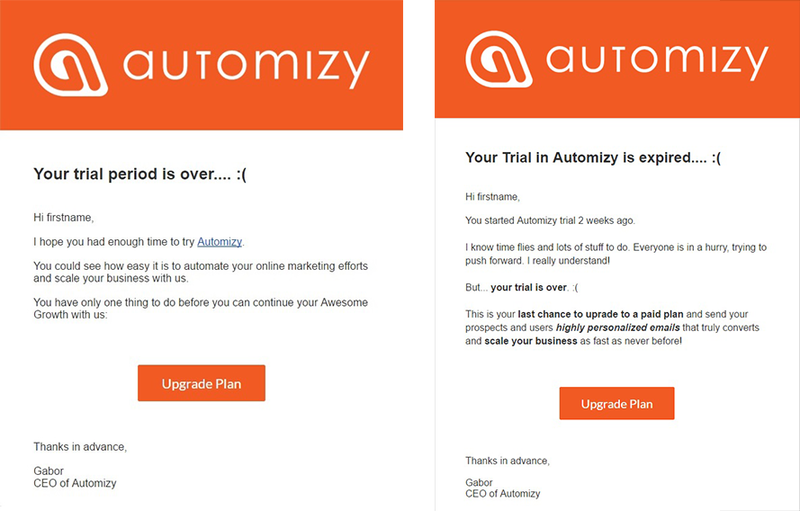 Now let’s have a look at a couple of onboarding emails and how AI-powered optimization can help you convert more trial users. In this example, there are 3 emails each with an A and a B variation. These are the most important onboarding emails in my opinion: the welcome email, a sales email midway through the trial, and another sales email at the end of the trial. The goal is to increase the overall click-through rate of these emails. The first is a welcome email that a prospect receives after registering for the trial variation of our service. This is a short, two sentence transactional email. It’s sent right after the prospect signs up, and it’s gibberish free. Just a little gratitude and an offer for a free consultation. This is a longer transactional email, and it has the same basic elements as the A version. In addition, there’s some social proof (2nd sentence), and an offer (3rd sentence) to reach out to us via email or in-app message. This offer is crucial because it is sort of a call for engagement. It shows that you care about your customers, and if you can provide solutions to their problem they are more likely to stick with you. Another additional feature of this email is the P.S., which provides more valuable educational content for the prospect, and that is just great during onboarding! As I previously mentioned it’s extremely important to send out the first email immediately because the users will expect it. And because of its importance, you need to nail this one. This is the message that will set the tone for your future communication with the user. Both of the examples could work because variation A is a straightforward, no bs email so the recipient might read it. Variation B however, can establish trust in the service and gives more value. The second one is sent out when a user has 6 days left of the trial. This one is a short email with a discount offer. If this email pops up in the inbox of an engaged trial user the offer should motivate the prospect to pay for the service much sooner. Voilá, conversion achieved! This version lacks the offer presented in variation A, but it is benefit-focused. So the less-engaged users can learn what advantages the software provide. However, even the more engaged users might not be aware of these advantages, and for them, this can be enough to make a purchase. When the user receives this email he or she has been using our software for 8 days. So depending on the depth of use, they are more or less familiar with the product and hopefully figured out if this is the right one for them or not. The third is sent out when the user reached the end of the trial period. Once again this is a short email notifying the user that the trial is over. It reminds the prospect of the benefit and points to the payment page. If the user is satisfied, this email can be enough to result in a conversion. This is a longer version of the previous email but in a personal tone. It shows compassion and highlights the main benefits of the product in a more detail. The other difference is that the text doesn’t point directly to the CTA as in variation A. It’s more of a subtle approach, but still, it feels like a click is the next logical step after reading the last sentence. So we looked at the example emails, now let’s see how to select the better-performing ones with traditional split testing and AI-powered workflow optimization. As we discussed in the previous article split testing automated emails manually is too technical and nearly impossible. So if you decide to do it brace yourself! The main problem with split testing emails in a drip campaign is that the exploration and exploitation parts are two distinct stages, which in this case will result in a very long test. Because to have significant results you have to wait a lot until enough prospects receive the emails. And the length of the exploration period will result in the use of outdated information in the exploitation stage. So if you want to test the emails in the example with manual split testing you should start out by setting up sending weights for each email like this: 50% for variation A, 50% for variation B. After the significance level is sufficient for each email, you should adjust the sending weights accordingly. You have to select a winner that received a higher click rate and continue by sending out that version out to everyone from now on. Not to mention you already lost people who received the low performing versions until you decide the winner variation. It might not seem too long or hard, but if you try it out you might hit some speedbumps. In addition, because of the nature of split testing even if your results are significant there’s a chance that the results are accidental which means sending out emails that perform worse. But there’s a way to avoid all of these struggles: testing with a multi-armed bandit and machine learning algorithm that optimizes your whole workflow for you. With AI-powered workflow optimization, all you have to do is set up the email variations and let the machine learning algorithm do its job. It is determining which email variation chain results in higher click-through (and consequently high conversion) rate. As your prospects are flowing through your drip campaign it is continuously learning and fine-tuning simultaneously the sending weights based on the click rates. As a result, it will send out more and more of the better performing emails, and less of the poorly performing ones. This cycle goes on and on, so the algorithm makes sure to always send the best possible email sequence based on the goals you’ve set up. Whether you’re just starting to develop your user onboarding, or you think you need to improve the process you should start by testing out variations of the most crucial emails in your workflow: testing is a tool that will help you have more engaged users. Higher engagement drives more sales, so it is an opportunity you should never miss! Next week we’ll publish the upcoming article, that explains how to build a loyal customer base and increase upsells by using and optimizing lifecycle emails. If you have any question feel free to share it in the comments, and if you want to give AI-powered optimization a shot it’s now in public beta! Take your user onboarding to the next level. Get started now! 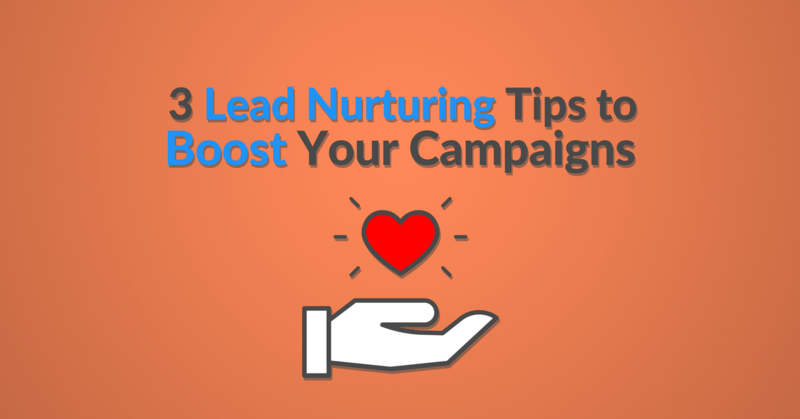 What is Lead Nurturing and How Does It Work? How to improve conversion rate of your trial registration process with automated emails and re-marketing? Nice post Gabor! Actionable and easy to understand, but I have a question. 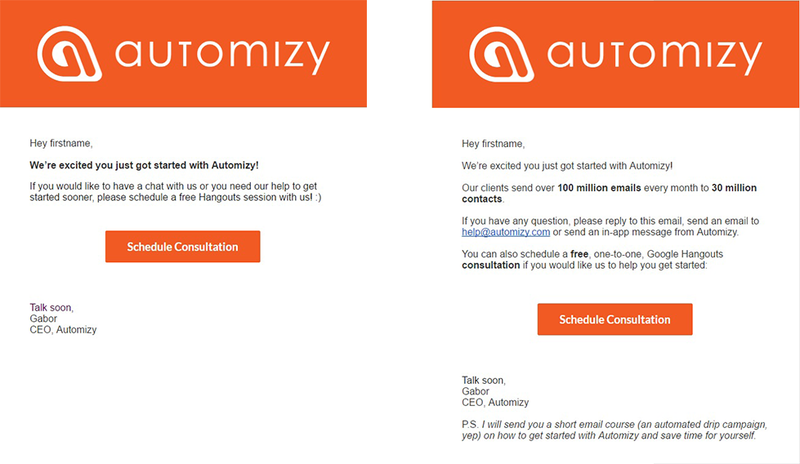 Is it possible to have 3, 4 or more variations for the automated email optimization? I’m glad you like it. And yes, it’s possible. You can have up to 4 email variations. I agree that MABs are a huge improvement over A/B testing although they do have a downside of losing some experimental power. Namely that when you are testing any particular statistical variation you need to have enough data points to ensure that the test is a valid one. Don’t get me wrong I’m a huge Machine Learning proponent–I’ve written two books on the subject http://a.co/g1yd4qc. But I’m curious what does Automizy do to help the user look at the significance and power of their tests? Great, thank you for the comment and your input. Sorry for the late reply. Currently, our AI is still in development. We found that most of our users aim to get things done efficiently without having to look at an overwhelming amount of statistics. So that’s why showing the significance is not a priority, yet. Maybe later if users will show interest in seeing the significance we’ll do it. As far as the power of their test goes: so far they can’t see the metrics for their automated emails if they use MAB optimization. But this is something we definitely have to sort out, and it’s already in the works. Check out this page: https://automizy.com/ai-solutions/ to see which way we plan to go with in the future. I’m a huge believer in creating user centered products so I get the sentiment. I guess for me though there’s a way to roll in statistics without being overly numbers focused. There’s some really neat tricks I’ve picked up over time to visually separate out what is a good test and what isn’t. As they say seeing is believing, and that is really what all of this is about is presenting data in an effective way such that the customer can be more successful with their email marketing.